Living at the edge, range expansion is a losing battle with mutations « Nothing in Biology Makes Sense! What differs at the margins of an expanding population versus the core? In this case, the authors assumed that the population size and growth rate differed. In the core or center of a population, the number of individuals had reached the carrying capacity of the local environment. There, the population is large and natural selection is efficient at purging deleterious mutations. At the margins, patches are founded with just a few new migrants. That means those patches are starting with very few members and stochastic processes can counter natural selection. While growth rates are high as the local patch swells to carrying capacity, selection is inefficient. Genetic drift weakens the efficiency of natural selection and allows some deleterious mutations to reach fixation in a growing patch. This leads to the pattern of a deleterious mutational load being found at the leading edge of an expanding population. The authors find under various scenarios that this mutational load can persist for a long time and leave a genetic signature within the population. I found the simulation model as well as the analysis in this paper very accessible. The authors clearly described this unappreciated phenomenon. I was intrigued by what other forces may interact and it led me to ask several questions. This study piqued my curiosity of how dispersal may influence the outcome of natural selection. The dispersal ability of individuals can vary substantially. Dispersal can play an important role in population dynamics, especially under the threat of anthropogenic habitat change (Thomas et al 2004, Williams et al 2008). I am curious about how variation in dispersal affects the interplay of demography and the evolutionary processes. During any model analysis, it is important to understand the implication of assumptions on the results and how they may provide limitations to interpretation. Population geneticists make a distinction when it comes to incorporating population demography into metapopulations. One distinction is called hard vs. soft selection (Whitlock 2002). Peischl et al (2013) assumed that each local deme, or patch, contributes migrants equally regardless of the local deme fitness. We also refer to this as soft selection. In contrast, it may make sense that demes with a higher local fitness contribute more migrants. This would be an example of what population geneticists call hard selection. Might the dynamics of the deleterious mutational load be different if the population was assumed to be under hard selection? If the mutational load still accumulates at the range margin, then at some point those patches will have a very low fitness and therefore contribute fewer migrants than they receive. This may result in a slowing of the range expansion. In the long run, the patches at the core, with a higher fitness, may contribute migrants of higher fitness that will weaken the overall mutational load at the margins. Of course, this is just a hypothesis. It is too complicated to just assume my intuition is correct and more analysis is needed. Looking at the code the authors published on Github (https://github.com/CMPG/ADMRE ), it appears they explored this case a bit. I’ll be curious if their future publications explore this effect. I was curious about exploring dispersal rates that differ across space. Hanski et al. (2004) suggest that newly established populations should have a higher frequency of dispersive individuals in the new habitat. This could lead to an excess of dispersive individuals in a high quality habitat potentially supporting a large population size. You may ask, what is the mechanism that favors dispersal at the range limits? Intuitively it is easy to understand: individuals and their descendants who made it to the outer edge did so by dispersing there. Phillips et al (2010 and later in Shine et al 2011) describe the process of spatial selection, by which higher dispersal rates are favored at the leading edge of an expanding population. Phillips et al even suggest that this Olympic village effect on dispersal could be a runaway evolutionary process. One famous example of this phenomenon is found among invasive cane toads (Rinella marina) in Australia. In 2006, Phillips et al found that the toads at the leading edge of the expansion had longer legs making them primary candidates for high dispersal capabilities. Later, Lindstrom et al (2013) found (via radio collar measurements) that those toads at the front of the range were more likely to disperse than those at the encamped within the population. Of course, all this getting around comes at a cost. Those long legged toads at the leading edge have been shown to have more spinal injuries (Brown et al 2007). So the question remains, how might differences in dispersal ability at the range margins effect the outcome of the results form Peischl et al (2013)? Again, one could imagine that higher rates of dispersal at the margins may magnify the effects seen in the paper. 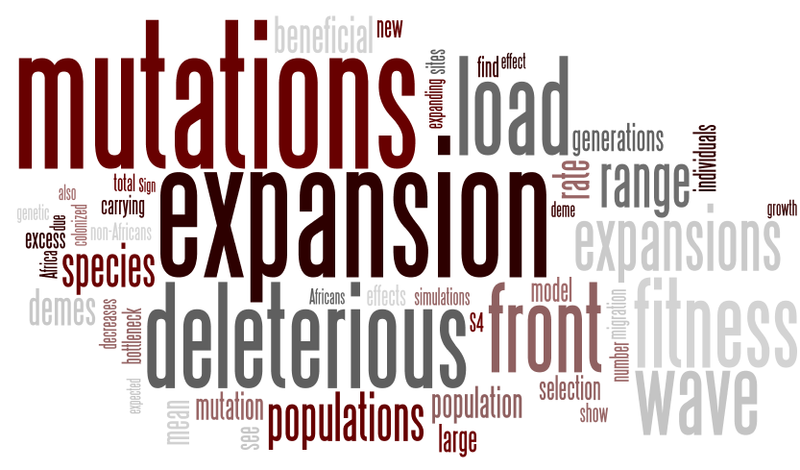 Deleterious mutations could surf to fixation on an accelerating wave of expansion. It remains to be seen how this would play out specifically in the model. When species encounter novel environments during the course of a range expansion, plastic responses of the phenotype which maintains high fitness across environmental conditions would enhance the chance of persistence. Invasive species offer an excellent natural experiment to study range expansion in modern time scales. The dynamic process of dispersal across a heterogeneous landscape as well as establishment in locally variable conditions influences the distribution and population genetics of a species (Kinlan and Hastings 2005). Only those individuals that can survive and reproduce once dispersed will lead to actual range expansion. Therefore, differences in the capacity of populations and individuals to tolerate variable environmental conditions will modify their ability for range expansion. Incorporating the effects described by Peischl et al (2013) could lead to significant new findings. This paper presents some exciting new research and it is clear from other publications of this group that they are working on many different questions about evolutionary responses to variable environments (Kirkpatrick and Peischl 2013, Peischl and Kirkpatrick 2012). Be sure to say tuned for future contributions. Kinlan BP, Hastings A (2005) Rates of Population Spread and Geographic Raqnge Expansion: What Exotic Species Tell Us. In: Sax DF, Stachowicz JJ, Gaines SD, editors. Species Invasions: Insights into Ecology, Evolution, and Biogeography. Sunderland, MA: Sinauer. pp. 381-419. Whitlock MC (2002) Selection, Load and Inbreeding Depression in a Large Metapopulation. Genetics 160: 1191-1202. This entry was posted in adaptation, genetics, invasive species, natural selection and tagged gene surfing, mutation, range expansion.